I’m standing on Whistler Plaza just west of the City Market in downtown Indianapolis on a gray, dripping wet Saturday afternoon waiting for my friend, Libby, who is joining me for a tour of the market’s underground “catacombs” provided by the Indiana Landmarks organization. Look for this sign on Whistler Plaza to register for the catacombs tour. But today the tour is starting five minutes early and she’s running about five minutes late which is ironic since she’s a downtown lawyer who bills her clients in six minute intervals. Big and hidden indeed. But, unbeknownst to many who frequent downtown, it’s not the only sizeable architectural gem that has spent some serious time out of sight and out of mind. For beneath our feet lie even more large brick arches, in addition to tunnels, and it’s these hidden gems which comprise the subject of the catacomb tour we are about to undertake. As I stand there listening to Barker tell how the arch was hidden between two buildings no longer standing on the site and wasn’t rediscovered until the early 1970s, I can’t help but wonder how many times I passed through this plaza while working downtown, and never really contemplated what the arch was or why it was there. Now, thanks to Mr. Barker and Indiana Landmarks, I know. 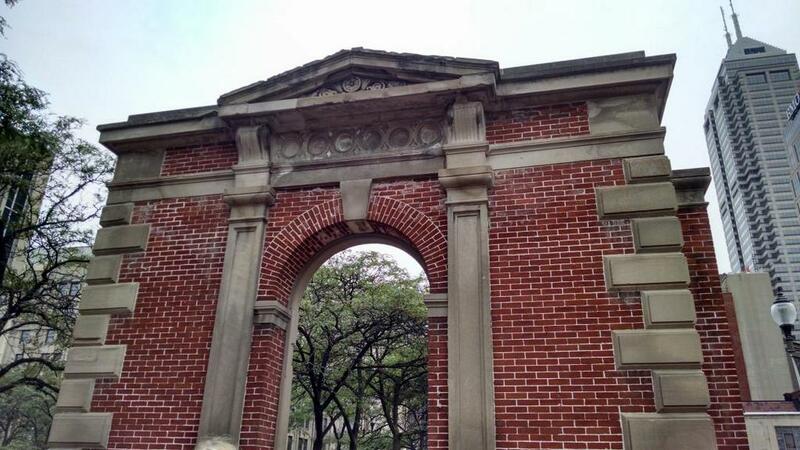 This arch and the series of arches beneath our feet are the last standing remnants of Tomlinson Hall, an imposing auditorium that once dwarfed City Market in size and played host to political rallies, speeches, conventions, musicals and dances, including Count Basie and his world famous orchestra which performed at a Valentine’s dance in 1953. 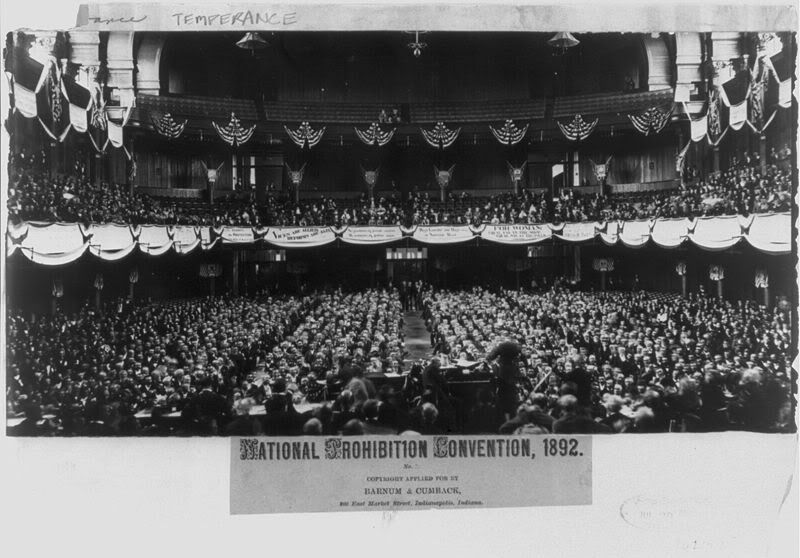 The hall was built in 1886 to compliment City Market and the former Marion County Courthouse across the way on Market Street, and the “catacombs” beneath Tomlinson served as underground storage for the hall and the market next door. 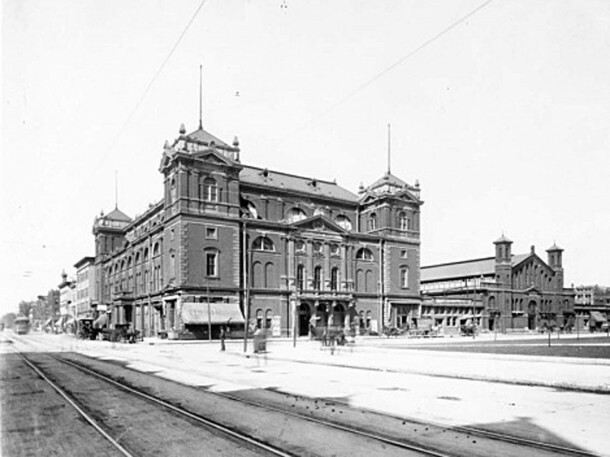 During its heyday in the late 1800s and early 1900s, City Market was the one-stop shop of its time, a forerunner to today’s supermarkets, while Tomlinson Hall was an entertainment destination with a main hall that seated up to 3,500 people. Unfortunately, Tomlinson Hall suffered a serious fire in January of 1958, leading to its demolition with the arch from the southeastern tower being the only above-ground feature still intact. Fortunately, nearby City Market and the underground storage area also survived the fire. After the history lesson, which included several pictures of Tomlinson Hall and City Market from their horse-and-buggy days, Barker led us into the market’s modern-day west wing and down a flight of stairs to a rather industrial looking hallway beside a rather nondescript gray metal door. For a moment, it made me think of Willy Wonka right before he opened the tiny door into his chocolate factory, but rather than finding Ompaloompas, I wondered if there were be some rather healthy rodents waiting on the other side instead. Sadly, no on both accounts. 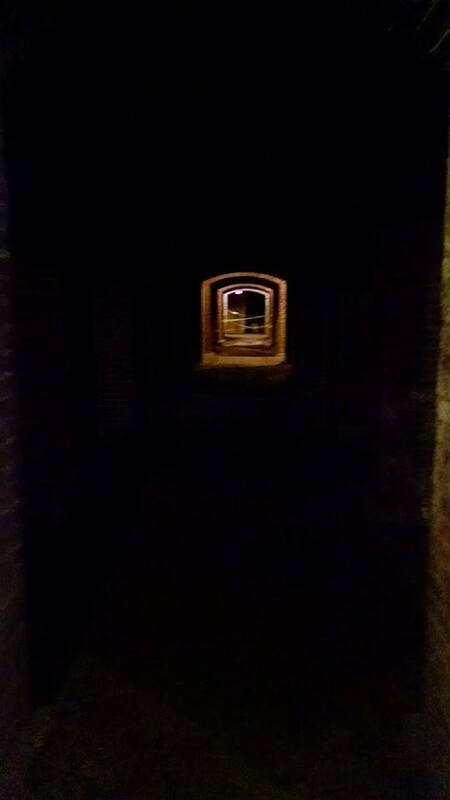 Leading the way, Barker took us through the door, flashlight in hand, past some modern utility pipes to the right at which point we turned left and, low and behold, there they stood, the brick arches of the catacombs, calling out to be explored. Technically, the area in question isn’t a real catacomb as nary a grave, skull or body can be found – which may or may not be a disappointment, depending upon your personal tastes – and, which in reality was once just a fancy basement to a large building at one time, but what basement it was. Built of a series of brick arches that angle off in every direction, it IS an imposing sight to see and is just well lit enough to be somewhat spooky. Call me crazy, but when I explore something underground called catacombs, I love a little ambiance and, in this case, the combination of low light and ample darkness delivers. I won’t give away the particular secrets of the tour as it really needs to be taken to be appreciated. 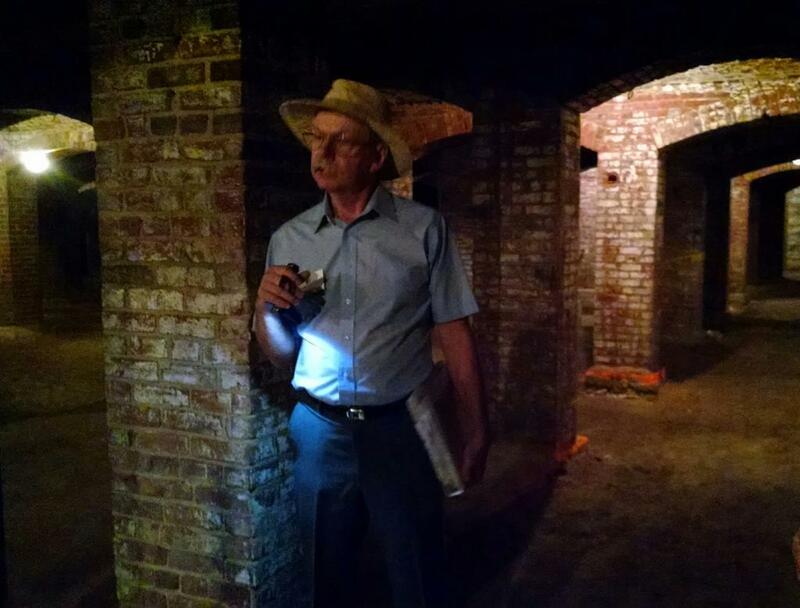 Needless to say, Barker led us throughout the space and regaled us with various tales of happenings down below which make you want to explore Indianapolis’ history even more. 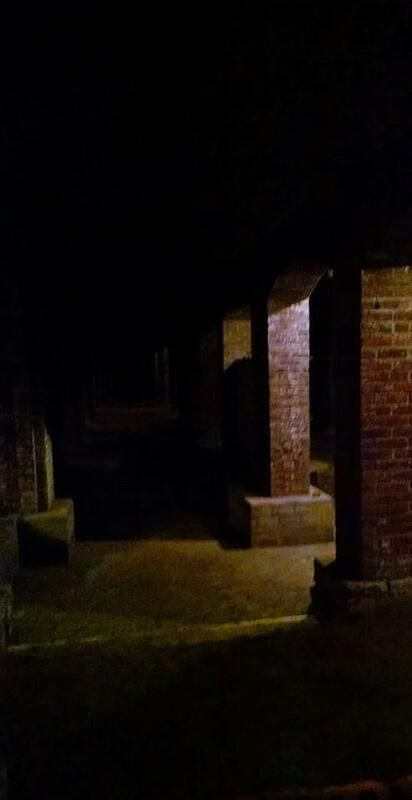 Walking through this space, touching the worn bricks and getting a “catacomb kiss” – a drip of water from the rain falling overhead – has you wondering what else is hiding away in downtown Indianapolis that has a history and stories to share and which deserve to be told. Fortunately someone with Indiana Landmarks felt that way about the catacombs, though no one can recall who first came up with the idea for the tours. According to Kelly Gascoine, Program Coordinator for Indiana Landmarks, the organization began offering the tours to guests in town for the Super Bowl in 2011. The tours proved to be so popular, the organization decided to continue offering them on a more regular basis and they’ve been popular ever since. Tours are offered in 30 minute increments from 11 a.m. to 1 p.m. on the first and third Saturdays of May through October, but groups of 10 or more can schedule tours at other times throughout the year too. In short, Indiana Landmarks is willing to work with you as it is proud of Indiana’s heritage and it never hurts to ask. The tours have proven to be so popular, that Indiana Landmarks recommends making reservations, though on the Saturday we attended, they were able to accommodate several drop in visitors, including Margareta Thorsen and Jenny Shih, the president and vice president respectfully of the National Association of Women in Construction, who were visiting Indianapolis for an industry convention and who were able to share their knowledgeable opinions about the structure. After the tour, in fact, Thorsen and Shih both commented that in earthquake prone California where they both live, such a tour couldn’t even be offered to the public due to liability issues. What’s a catacomb tour without a little ambiance? The tours cost $12 for people ages 12 and up, unless you’re a member of Indiana Landmarks at which you can take the tour at the discounted price of $10. For ages 6 to 12, the price is $6. Proceeds from the tour are split evenly between Indiana Landmarks and City Market, with Indiana Landmarks’ portion used to help preserve historic sites in and around Central Indiana and the state. If tickets are bought in advance through Eventbrite, one can select the time of the tour preferred and print them out at home or you can take a chance and drop in on a tour which normally start at the top and bottom of the hour. Three volunteers were on hand the Saturday we visited, and we broke up into two groups of 10, but the weather was uncooperative that day and may have damped attendance so be forewarned. In essence, drop in guests may miss out if the weather is nice and downtown is hopping with activity. The online ticket I purchased stated in large letters that attendees must wear covered shoes, but for those of us like me who only notice that warning while standing in line moments before the tour need not fear as drop-in guests in flip flops and unobservant idiots in sandals like myself were not turned away. Looking back at the website days later, I noticed that it states covered shoes are recommended – as opposed to required – as is stated on the ticket. Participants do need to sign a liability waiver as the dirt floor is very uneven, and guests in wheelchairs, walkers, or strollers or even those with canes can’t be accommodated at this time which is unfortunate, but which is a reality when touring a space that hasn’t seen the light of day in over a 120 years. 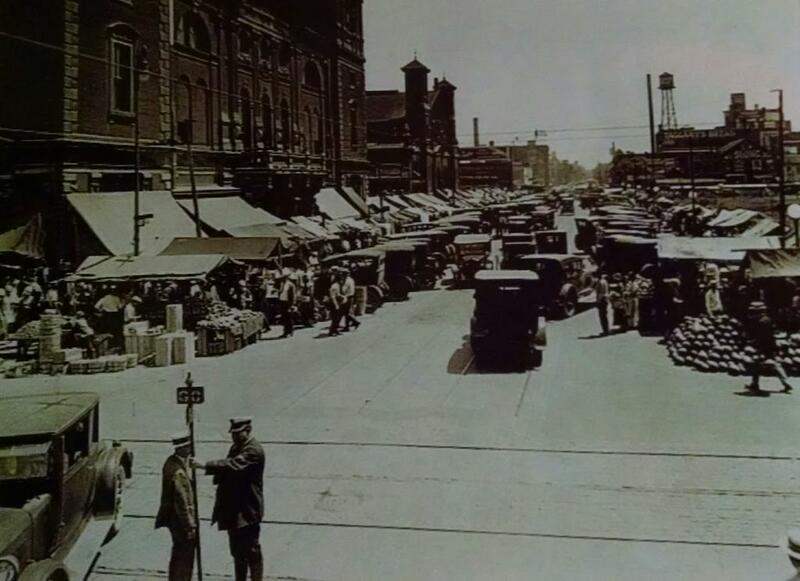 Market Street in front of Tomlinson Hall – Picture courtsey of Indiana Landmarks. The tour is rather quick, but well worth the $12 as it catapults you into a space that harkens back to a simpler time. Looking at old sepia-toned pictures of Market Street crammed with horses and vendor stalls and people before Tomlinson Hall fills you with a sense of wonder. Our downtowns from Indianapolis to Greensburg to Madison at one time really were the place where one went to get it all. From meat to milk to nails to haircuts, they were the heart and soul of our communities. Yes, time marches on and things change, but sometimes we would do well to spend a little more time contemplating what life was like in another era. 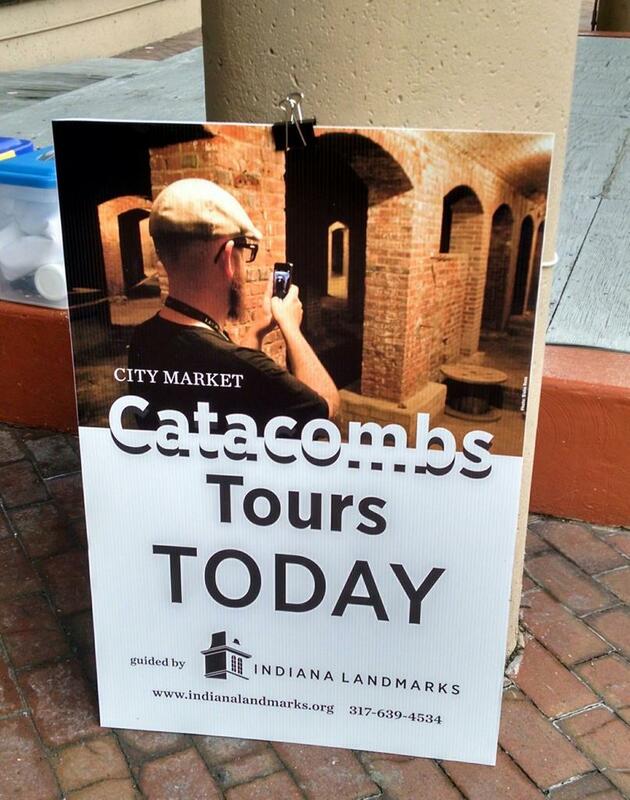 The City Market catacomb tour is one such opportunity. 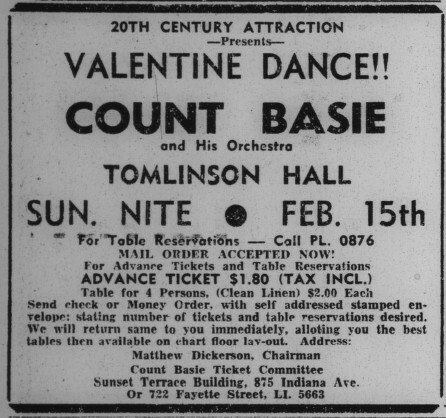 For more information on Tomlinson Hall and the catacomb tour, visit Indiana Landmarks’ website at http://www.indianalandmarks.org/tours/calendar/Pages/SearchResults.aspx?EventID=567. Tickets for the tour can be purchased online at https://catacombs2014.eventbrite.com. For more information on Indianapolis’ historic treasures, check out Historic Indianapolis.com. 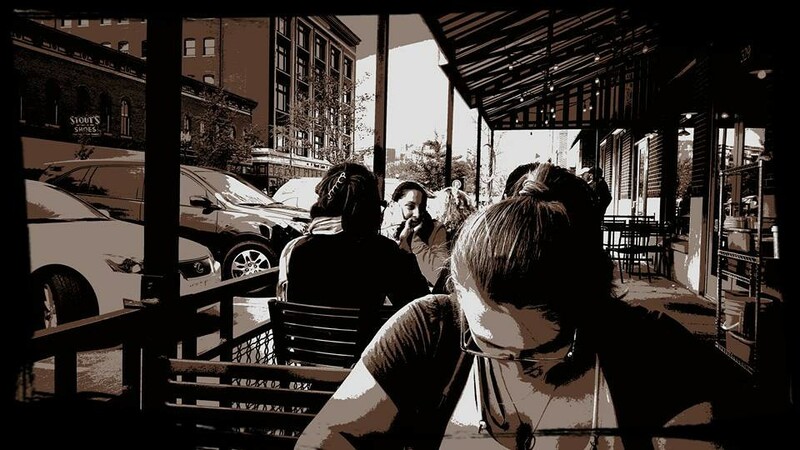 My friend, Libby, is a contributing writer to Historic Indianapolis and walks the walk from her restored home in the old historic Northside District where she sits on the board of the Old Northside Neighborhood Association. 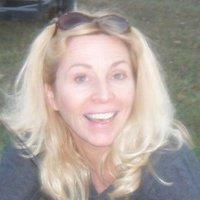 You can catch up with Libby and her articles at http://historicindianapolis.com/heritage-steward-libby-cierzniak/. Next Week – I get certified to scuba dive and tell you how you can do the same. Reprinted with permission from the Greensburg Daily News and Indiana Media Group.